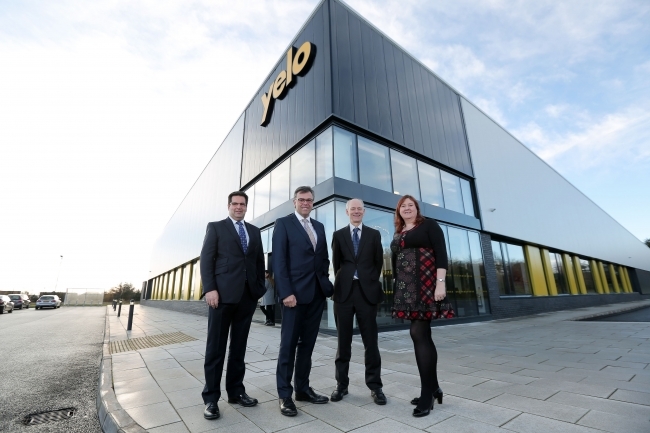 Leading test equipment manufacturer, Yelo, has officially opened its new 25,000 sq ft facility in Carrickfergus, Northern Ireland. Yelo designs, develops and manufactures sophisticated automated test equipment for testing and measuring the performance of lasers, radar systems and electronic products. Its customers include high-end manufacturing/software development companies such as Cisco and Schneider Electric. The company purchased the 3.5 acre site from Invest NI and constructed its purpose built facility in less than two years. The high spec mechanical and electrical manufacturing facility boasts a clean room, anti-static flooring and a flexible production layout to suit business needs. Speaking at the official opening, Invest NI’s Chief Executive, Alastair Hamilton said: “This new facility marks an exciting new chapter for Yelo that will facilitate the company’s continued growth in North America, Asia and Europe. He added, “The investment that this high tech company is making in Carrickfergus is a positive endorsement of both Northern Ireland’s manufacturing industry and the expertise of its skilled workforce. “The company has experienced an increasing demand for its products. This new state of the art building, constructed with our support, gives Yelo the additional capacity and capability to win and fulfil larger projects for its growing, global customer base. Richard Furey, Yelo’s Managing Director, added: “We were keen to design a working environment that reflected the ethos of the company and this custom built facility is a significant achievement in the history of the business. “Our new site offers the amenities we need to continue to grow in our target markets. We are grateful for the expertise and support of a range of partners including Invest NI, Architects Teague and Sally, Danske Bank and OB Construction. “With Invest NI’s continued support we have been able to develop our advanced technology through R&D assistance and then to bring the technology to market by means of trade missions, particularly the US market, still our biggest and now our most successful source of business.